We began our review of the 2008 season with a look at the points scored by the Steelers' offense (the short version: not many). We now shift our focus to the defense, and if any of you are surprised by what we found then you just were not paying attention this season. The 2008 edition of the Steelers' defense grudgingly gave up 223 points ~ the second lowest total for a Pittsburgh defense in the past nine seasons (inclusive ~ the 2001 defense gave up 212 points, and that year the Steelers went 13-3), and the third lowest total by a Super Bowl champion during that same period (the 2000 Baltimore Ravens gave up 165 points, and the 2002 Tampa Bay Buccaneers surrendered 196). The only surprise here is how well Tampa Bay ranks, and it is testimony to how choosing a sample set can have a profound impact on the results. In three of the past five seasons the Bucs have surrendered 300 or more points (including 323 this past season), however in the four prior seasons (i.e. 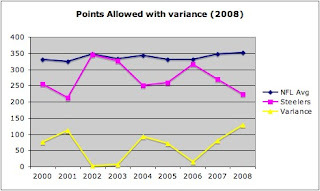 2000-2003) they never surrendered more than 280 points in any one season. We do not want to say that anyone was living off their reputation but it seems clear that Tampa Bay's defense has seen better days. As for the Steelers it is difficult to imagine that they could improve on their 2008 performance; however the 2001 group has set the bar (i.e. in terms of scoring defense) and until they surpass that group then improvement remains possible.